1 item(s) available at last update. One of the most important photos taken at your wedding will be when you are signing your Marriage Certificate. You photographer will usually also take close up pictures of you actually signing the certificate. Do you want your cheap office pen immortalized for ever in your photos, or would you prefer to have a beautiful pen that looks fabulous in the photos? Of course a nice pen is also required for the signing of your guest book, but that goes without saying. We suggest using the same pen for both the signing of the marriage certificate and the guest book. 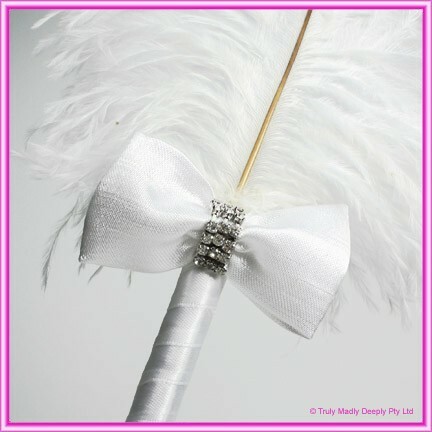 This stunning white wedding feather pen is for those who demand beautiful. It features a base covered with beautiful fabric that is similar in look to Thai silk, and a beautiful sash that is set with a brilliant glimmering diamante clasp. The clasp is a quality product with glass diamantes and set in a metal base that doesn't tarnish. 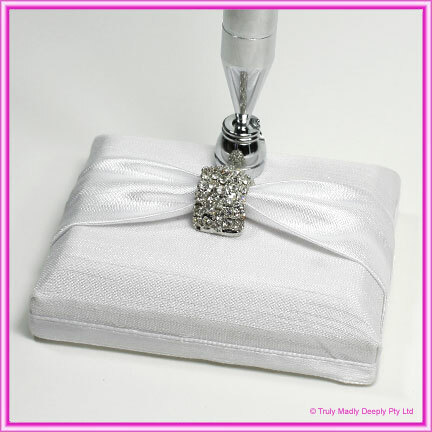 The ball point pen is wrapped in white satin and features an white satin bow with another smaller diamante clasp. 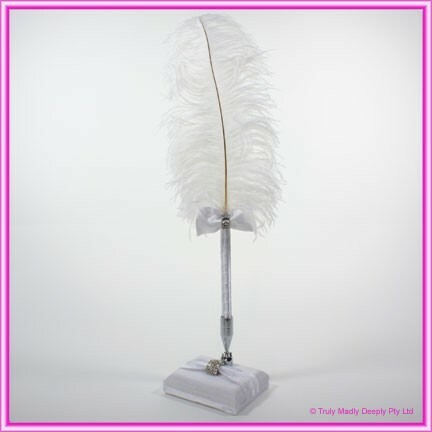 The top of the pen features a large white ostrich feather/quill. This is truly a magnificent pen. See detailed images below. Such a beautiful pen will be admired by all at your wedding. Important Tip : Like any new pen, they often take a little scribble to get the ink flowing - ensure you do this before your wedding day! Matching wedding guest book is also available in this collection. See below for details.